It’s important to take time to think about what collection really means: it’s finding an item or a theme that you think is interesting or exciting and holding onto that item and developing that theme. And, ultimately, collections can be very personal; for instance, your memories of the items you’ve collected can be just as valuable as the items themselves. Maybe you remember auction sniping an expensive item at the Auction House; alternatively, maybe you saved for weeks just to have enough Neopoints to buy it. To reflect on your collections is to think about what you have and your relationship to it. Why do you like your collections? What do you wish were different about them? What are your favourite memories about them? In the spirit of thinking about collections and collectors, we’ve decided to cover a few of Neopia’s greatest—or, at least, most infamous—collectors. Maybe you’ll find a collector you admire, or maybe you’ll find a collector you don’t really like. Either way, we hope this will get you thinking a bit about your own collection. Maybe it’ll even make you want to start one, if you haven’t already. Without further ado, let’s begin! Perhaps the most obvious collector in Neopia is Altador’s Gordos. He’s even known in the Hall of Heroes as The Collector, a title surely only reserved for the most dedicated collector. His signature constellation is a set of scales, which intimates at what he’s best known for in Altador: being the city’s tax collector. He’s best known for collecting money from Altadorian citizens and for his reasonable tax rates. That being said, Gordos does show up at other times; not only is he a tax collector, he also seems to collect stamps in his free time. There’s a random event in which he’ll appear, call your stamp collection “pathetic”, no matter how many stamps you have, and hand you a high-rarity stamp. This can be relatively cheap, but it could also be worth millions of Neopoints! While we could probably do without the condescension, we do really appreciate Gordos’ generosity and he’s an exemplary collector: while he has a lot, he doesn’t hesitate to help other people with their collections as well. Sometimes collaboration is really important and the only way we ever reach our goals, and Gordos understands that better than most. Next on our list is another beast entirely: The Snowager. The Snowager’s a bit of an enigma, actually: he’s a massive ice worm that guards an enormous hoard of Neggs, cannons, and a bunch of other miscellaneous treasures, impossible to even count. Maybe the biggest question is how he got hold of all of these items, anyway? Were they just lying there and one day the Snowager claimed them or did he slowly accumulate them? Either way, the Snowager is one of the most infamous collectors of Neopia, not only because of his massive trove of items, but because he’s very good at keeping his items. And that’s because he’s very strong: a blast from him will decimate your pet, no matter how strong it is. Legends even say that he sometimes eats Neopets for his meals! Not only that, but he’s awake for twenty-one hours a day. Even when he’s sleeping, he occasionally wakes up and fires a blast of ice at many hapless adventurers who dare to try to steal an item from him. For obvious reasons, we were unable to secure an interview with the Snowager. He isn’t really a paragon of kindness or fairness—if anything, he’s the very image of violent greed—but it’d be hard to deny that he has one of the most impressive collections in all of Neopia. Illusen and Jhudora aren’t the first Neopians that come to mind when you think of collectors, but they actually are collectors in their own right. They host two games on the site, Illusen’s Glade and Jhudora’s Cloud, in which you have a thousand seconds—sixteen minutes and forty seconds—to find an item for them. These quests, especially in the last few levels, can get really expensive, but Jhudora and Illusen award very nice prizes after completing fifty quests for them. But exactly what they do with these items once you retrieve them is unclear. It must be something! 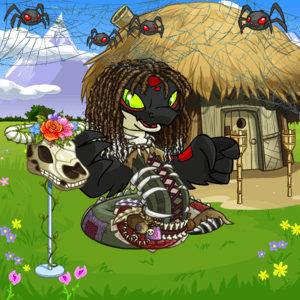 Maybe Jhudora’s casting a years-long spell to overthrow Fyora, or maybe she’s just testing new recipes for her Bartamus. Illusen might be working on a special charm or a spell or maybe she just likes pretty, expensive things. Even if we don’t really know what the faeries do with the items, we can almost guarantee that they have a ton of items that Neopians have gifted them over the years. Why do still they need more after all these years? Well, that’s a really good question, and not one we know the answer to… in any case, Jhudora and Illusen must surely be working on something very important. But an important lesson that we can learn from Illusen and Jhudora is that ultimately a collection can be greater just than the sum of its parts. For instance, in the span of a couple days, Jhudora asked me for a Copper Bracelet, a Snot Spear, and a Fire Eyrie Plushie. After that, she told me, “soon Faerieland will be under my control!” It’s hard to imagine that she’s not plotting something massive and important. Either way, they do at least give you rewards for helping them out, so they’re not all bad. Shopkeepers also deserve some form of recognition, particularly the Neopian Post Office shopkeeper and the Collectable Coins, Card, and Sea Shells shopkeepers. Without items, there’d be no collections, so it’s important to celebrate the salespeople who keep the shops stocked and continue to make or find interesting items for us. This goes double for the shopkeepers who stock collectable items. Stamps, coins, cards, and sea shells are some of the most popular collectables in Neopia, so the shopkeepers who distribute them should be commended for their fine work. Whether you’re just starting out your stamp or card collection or looking for that last stamp or shell for your album, the shopkeepers are more than happy to sell you the items you desire—if you have enough NP, of course. These are just a few collectors throughout Neopia who might be interesting or important for some reason. Every collector is different, just like every collection is unique. Maybe we didn’t focus too much on why collect, but here’s the thing: even though the why is largely unknown in most cases, it isn’t often relevant and speculation seems unhelpful. What would we do if we knew why the Snowager wanted to hoard items nonstop? You don’t need a why to start a collection, it can be as simple as just liking an item or group of items and building from there. Maybe you just feel like collecting pretty items. Who knows? Maybe one day you can build a collection as massive as Illusen or Jhudora’s or be as rich as Gordos. But even if the collection you want is just five items big, who cares? The most important thing is that your collection is important to you, whether it’s big or small.